Sullivan topped 2010 GOP Senate nominee Joe Miller, with Lt. Gov. Mead Treadwell coming in third place. Miller, who was backed by former Alaska Gov. Sarah Palin, surged in recent weeks, but wasn't able to close the gap with Sullivan, who enjoyed a fundraising advantage over his opponents, and who had the support of many mainstream pro-Republican organizations. 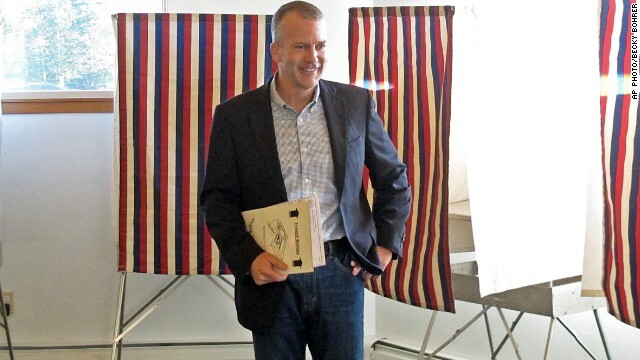 Groups such as American Crossroads and the U.S. Chamber of Commerce, which tend to back establishment GOP candidates, supported Sullivan, as they saw him as the strongest Republican candidate to take on Begich. Sullivan also had the backing of the Club for Growth, which often endorses more conservative Republican candidates. Sullivan, who was also the state's director of natural resources, came under attack for his ties to Alaska, and for his record in state government. Sullivan's originally from Ohio and didn't live in Alaska for a chunk of time last decade when he worked in the George W. Bush administration and in the military. The attacks came not only from Sullivan's Republican primary opponents, but also from pro-Democratic groups that are backing Begich. Some of those groups spent big bucks to go up with ads critical of Sullivan. In a victory statement, Sullivan tied Begich to Senate Majority Leader Harry Reid. "Harry Reid tried to stop us, but his millions of dollars of attack ads didn't work. Mark Begich, his loyal lieutenant, has spent the last ten months trying to avoid talking about his failed record. Now is the time to focus on the real issues that matter the most to Alaskans. I look forward to painting a clear contrast between Mark Begich’s inability to move our state forward and my vision for a brighter and better Alaska," wrote Sullivan. The Democratic Senatorial Campaign Committee quickly fired off a statement, saying "Sullivan is wrong for Alaska women, seniors, and middle class families." "Sullivan is an Outsider and his campaign is bankrolled by Outside special interests that want to privatize Medicare and Social Security, eliminate a federal minimum wage, and protect tax breaks for companies that ship jobs overseas," added DSCC Deputy Executive Director Matt Canter, in a statement. With the primary over, the amount of attention and outside money flowing into the Alaska showdown will only intensify. Democrats have a 55-45 majority in the Senate (53 Democrats and two independents who caucus with the party). But in the midterms, the party is defending 21 of the 36 seats up for grabs, with half of those Democratic-held seats in red or purple states like Alaska. "that is just precious coming from you after thousands of posts calling george bush a liar." Bush lied = 100,000+ died. Obama lied = 20M people have gotten health insurance. We still have record unemployment, 6 years later. We never left 2008 thanks to Obama and his insane policies. Welcome to the Lost Obama Decade. I see that the right wing trying to have it both ways again. On the one hand, the right rants and rails on about Obama's failed economic policies. On the other hand, the right raves and rages on about they've stopped Obama's agenda in its' tracks. This is no different from calling Obama a "do nothing" POTUS, while at the same time complaining about how he is an overreaching dictator. Come on, man. Which is it? why would lefties admit errors or failure when they find it far easier to lie and blame others? Look at that. Speak of the Devil. Instead of acknowledging errors for what they are, you prefer to call people liars. that is just precious coming from you after thousands of posts calling george bush a liar. Could someone, anyone, please tell me why a working person would vote for a party that simply wants them to sacrifice for the wealthiest of us, who are incredibly well off. They have not done anything I have seen to help the ones the keep telling to vote for them, in order to make their lives better. This is incredible that they manage to stay in power, amazing, truly is. I believe it is largely from a strong connection (or even addiction) to an ideology, with a subconscious (and potentially delusional) hope that they will one day strike it big themselves. That last part is supported by the plethora of pull tabs you can see people go through at an American Legion or other bar. Yes, it is still possible to work hard and get ahead in America, despite the looney lefties mindless ranting about things being "rigged against them". A majority of the American people still think it is better to at least have the opportunity to get ahead and become rich, than to settle for what the left has to offer, guaranteed equality in poverty. Not all of us strive to become government dependents/slaves. Some of you better lift your heads up and look at all the problems coming down the pike. Not only is the Federal Government out of money but many municipalities are also deep in the red. On top of that there are 150,000 illegals looking for welfare from guess who, Uncle Sam, (You). Fiscal Responsibility is sorely needed, or a return to the 1930's, if we are not already there. bush, as well as the clintons relied on intelligence provided, by the usa intelligence services and foreign intelligence services. where is your proof of lies? there is none. so bill clinton and hillary clinton were also lying when they spoke of saddam hussein's wmds right? Obama lied = 20M people have gotten health insurance. 200M had their healthcare turned upside down, paid higher taxes, lost their hospitals, doctor, healthcare plan, paid more and got higher deductibles, etc. and the worse of the obamacare nightmare is yet to come!! and it will, unless democrats are driven out of office. If you don't like Congress (and the August 7-10 Gallup results say 83% of you don't), then get rid of the repub/tea bag majority. If you don't like the Senate constantly coming to a standstill because of the unprecedented use of the filibuster by the repub/tea bags, then give the Dems a 60+ seat majority. It's the only way things will ever get done. Dems know how to listen to the opposition party and build consensus – hell, Obamacare is BASED on the Heritage Foundation principle of the individual mandate, all your whiny about it being "jammed down your throat" to the contrary! Get out and vote on November, 4, 2014 and November 8, 2016. The working class vote for Republicans for a sense of security and normalcy, too much change is not comfortable and even if you are making the rich even richer, the sense of normalcy is more important that fairness. just asking, Clinton (Hillary and Bill) and the democrats didn't have prior knowledge of intel that stated that Iraq had no WMDs and that the source they were relying on was not reliable. The Bush administration didn't share this intel with the rest of the class until after the war was already in full swing. And let's not forget such favorites like "oil will pay for it" and "we'll only be there a few months". Gunderson- just one brief moment of sanity, please. What party gave the richest people in our nation a pass not to pay their fair share of taxes? Why, that's the GOP. What party refused all through two wars to actually pay for them? Why, that's the GOP. What 3 Presidents tripled, doubled and then tripled the Debt? Why that's Reagan, Bush and Bush. See, I know facts are hard- but 40 years of Republican Voodoo economics (their term) and "deficits don't matter" (Cheney) drove this country to bankruptcy. Why in the world should we let these idiots near the money every again? Um Sorry THINK AGAIN, you better think again! We have been doing things your way for the last 100 years! Now up to 18 Trillion i debt. How much more do you want? Better wise up! "Yes, it is still possible to work hard and get ahead in America, despite the looney lefties mindless ranting about things being "rigged against them". A majority of the American people still think it is better to at least have the opportunity to get ahead and become rich, than to settle for what the left has to offer, guaranteed equality in poverty. Not all of us strive to become government dependents/slaves." Yes, it is still possible to work hard and get ahead in America (yes, this is what Dems believe- they just think it should be fair fo ALL Americans to have this opportunity and NOT just the children of rich white people. ), despite the looney lefties mindless ranting about things being "rigged against them" (as opposed to the righties absolutely insane idea that we should not help the people who need it, rather we should lavish billions on the people who own yachts and high rises because of their known propensity to help the downtrodden by depositing this largesse in the cayman islands, moving American jobs overseas , and laughing at the ignorant rubes who continue to fall for this crazed scheme because hannity and o'really told them to?). A majority of the American people still think it is better to at least have the opportunity to get ahead and become rich (is this the majority of the American people who elected Barack Obama, or the majority of the people you fantasize about believing this nonsense? If they believed that they would move out of the red taker state they live in and come to a blue state where they can get a job and they can contribute... not sit at home collecting their check and ranting about the lefties not allowing them to get rich... somehow), than to settle for what the left has to offer, guaranteed equality in poverty (Silly.... we just want equal opportunity and justice for even the least of our citizens... even you... you know, like the founding fathers believed). Not all of us strive to become government dependents/slaves. (no, you just don't want them brown people getting a welfare check that might cut into your disability check... and why should they get to live in your trailer park!- you crack me up). '"200M had their healthcare turned upside down, paid higher taxes, lost their hospitals, doctor, healthcare plan, paid more and got higher deductibles, etc. and the worse of the obamacare nightmare is yet to come!! and it will, unless democrats are driven out of office." I relied on data, while you rely on self-serving ispe dixit propaganda from Faux and the rest. There's nothing whatsoever to support your assertion. Nothing. Not a scrap of evidence nor compilation of data. According to John McCain's interview with CNN about a month ago, the primary source of U.S. intelligence on Iraqi WMDs came from some code named "alcoholic in a German jail cell." I forget the code name they used at the time. Say what, I work 50 hour weeks make close yo six figures, which is a long way from being in the gop camp, I'm not foolish enough to think that if the gop eliminated all social programs, they would not put one red cent back in your pocket, or mine, and the deficit would not see a nickel eirher. But tax cuts for the rich will create so many jobs we won't need social programs, what the he11 are you drinking,? The rich take so much of the wealth now, I can't seriously believe a little more is the answer, you act lime there's a tipping point, where if the rich get enough money, it will pour out over us all, how much more than 1% taking 95 % does it take? Missouri Gov. Nixon takes sides in shooting. Wheres the coverage CNN? Oh yea he is a Democrat. He should step down now! Shameful and dishonest. Where is equal justice? As far as the WMD's that took us into 2 completely useless, expensive wars for which there was no budget, do people have voluntary amnesia? Am I the only person who remembers seeing Hans Blix & his UN crew, on the news, going over Iraq w/a fine tooth comb Before W, the decider ( as he called himself) took us to war! The verdict from numerous WMD hunts by Blix & his team was that there was nothing to suggest any stockpile of weapons or connection to Al Qaeda, but Bush went ahead w/his agenda anyway! I also recall Cheney declaring that the war had no end date! If it lasted 100yrs, so be it! No wonder there are people who feel these men are war criminals!! Sniffit, since Pres.Obama took office, There are 103.4 million people currently enrolled in any one of 15 subsidized federal food assistance programs. The most people in our nation's history. Due to the governments sloppy management of resources it's anybody's guess how many people are standing in how many lines, at the same time. One thing we do know for sure is one third of our nation is now receiving Subsidized Food Assistance. These programs are extremely expensive and the cost is increasing daily. In 2012 the bill to taxpayers paid was a staggering $114 billion. Even more shocking: The Bureau of Labor Statistics (BLS) reports there are 97,180,000 full time workers in the private sector. This means: The number of people receiving food stamps is greater than the number of people in America working full time. "Not all of us strive to become government dependents/slaves." Now, if only the GOP could find a candidate ... any candidate ... who ran on your above statement .... ? Well, to be fair, there are other statements as equally offensive as what you've referenced from the right wing candidates and their supporters ... but, I know, I know. Baby steps. Tiny Baby steps.